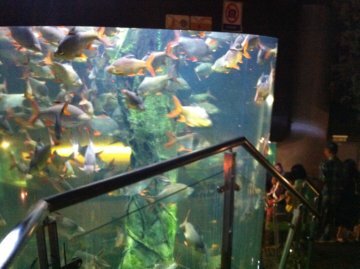 Aquaria KLCC, right in the middle of town, a nice place to go. So I have been to Aquaria KLCC before but I decided recently to visit again, just to make sure what I knew about it remains. Aquaria KLCC is right smack in the center of town, the 'CC' stands for 'City Center' and KL is my 'other town' Kuala Lumpur, the capital city of Malaysia. Of course the name gets a bit misleading, cos this public aquarium is also situated in a convention center, also called KLCC (Kuala Lumpur Convention Center). 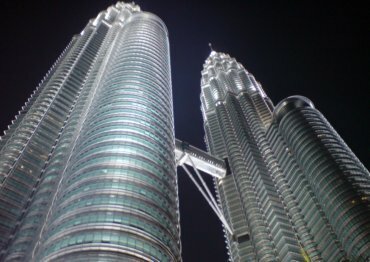 Whichever way you wanna take it, this aquarium is basically part of the buildings around KLCC, underneath the majestic Petronas Twin Towers, still the tallest twin buildings in the world. Getting there is easy, there is a subway station (Putra LRT line) that stops right by this complex and cabs know this place well. It costs roughly somewhere between 8-15 USD to get into Aquaria KLCC, depending on whether you are a kid, a senior citizen and whether or not you have a Malaysian Identification card. The price is pretty decent for US Dollars but gets a bit hefty for the locals so its an understandable differentiation. Others may argue otherwise I guess. So is it worth the cash? Well its definitely a good place to go 'look see' no matter what currency you may hold dear. Its a place easy on the eyes so to speak and easily will take up a minimum of 45 minutes of your time, probably an hour and a half or two for good leisurely appreciation. 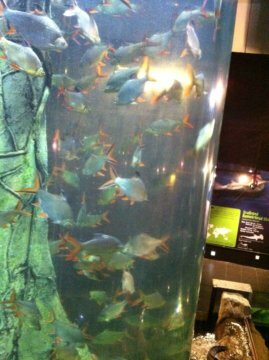 Once you are in the Aquaria KLCC, you are first greeted by a school of Piranhas!! Of course its awesome to be greeted by tropical fish, but why Aquaria KLCC decides to use a tropical fish from the Amazon, far and away from South East Asia is slightly mind boggling. I suppose there is a 'River Monsters' feel to it, to borrow the name of Jeremy Wades show on TV. 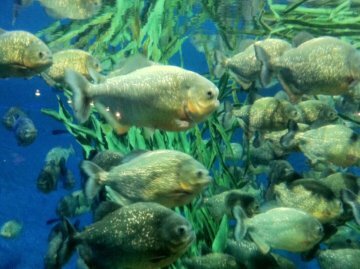 Either way, its a pretty spectacle, cos there are a whole bunch of easily 2 palm sized piranhas. They have a scheduled daily feeding session too for all to view. They have the timings listed on their site which is cool. 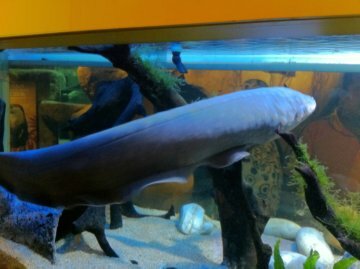 So the exhibit basically continues with the Amazon theme, first running into an Electric Eel, again another favorite of the Discovery Channel And National Geographic Channel. 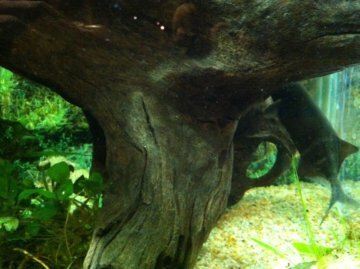 The Elephant-nose fish is next and these guys are from Africa. In some ways, the water denizen-ship is coming closer to South-East Asia, first South America, then Africa and hey next should be Asia right? Well yeah sorta, cos the next thing you see are nutria from South America, the local Asian Small-clawed Otters (Known in Malay as 'Memerang' or more accurately 'Memerang Kechil' - Kechil means small), all of which were sleeping unfortunately. Then there is an exhibit of Denisons Barb which are supposed to be from Kerala and Karnataka which are southern States of India (along with other fish such as Angel Fish which are again from the Amazon). So basically in terms of geography, its a bit topsy-turvy but I think they are preparing new exhibits so it may make much more geographical sense later on. On some level I guess Aquaria KLCC is trying to showcase variety in the beginning as well as showcasing Community fish. Further on. 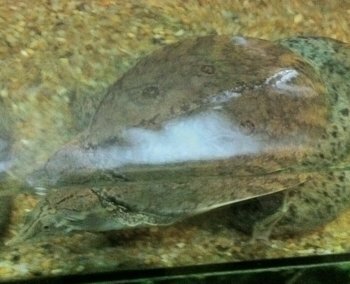 there are some fauna exhibits from the tropics, reptiles in the form of snakes and lizards and of course some from South-East Asia such as the soft-shelled turtle. Its at the end of these exhibits (Aquaria KLCC does have a lot of those plywood walls implying 'work in progress' behind them lining the exhibits), that you hit the spectacle of this public aquarium. You are greeted by essentially a huge cylinder of water filled with tin-foil barbs. Locally called, 'Lampam' or 'Lampam Sungai' (River Lampam). There are hundreds of these guys and they swim at all levels of this cylinder like structure. Quite a unique setup and really a huge wonder on how it all works, feeding time must be quite interesting as they would need sinking pellets I would think! A set of stairs right next to it conveniently allows you to gape at this wonder. Once down the stairs, you are greeted with huge pools on your left of local South-East Asian fish like the Mad Barb or Sultan Fish (known locally as 'Jelawat'), Seven Striped Barb (known locally as 'Temoleh'). These are large fish, about the size of a human arm. All freshwater Fish. A couple of other fish in there as well, supposedly the Malaysian Red Mahseer and Rohu (from India). On your right, is a huge tank full of South American (only) tropical fish species. 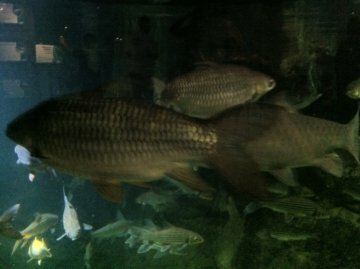 Aquaria KLCC has invested in a bunch of huge tropical fish here with at least a pair of Arapaima or Pirarucu, some sizable Pacu, and large Red-Tail Catfish, all would pass the 'Monster Fish' criteria of Dr. zeb Hogan. The next pool on the left housed some more Tin-Foil Barbs but also some Silver Sharks or Bala Sharks (locally known as 'Hangus' - meaning burnt or 'Hangus Ekor' - meaning burnt tail) - I have only recently discovered that The Silver Shark is a local species from Malaysia. I dont think too many people knew that, did you? Its the creature next to this pool thats most interesting to me. Its Latin name is Wallago Leeri (So I am again using a Latin name I know... but how else to identify it to you experts out there right?) and locally called 'Tapah'. You see this fish is legendary in Malaysia. Local lore says that this is a man eater. 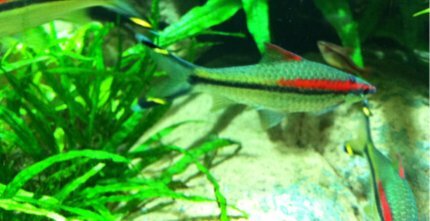 Thats right, its one of the few freshwater fish around and probably one of the few in the tropics or anywhere that has the reputation of eating people. It doesnt look at all like one though! It basically looks like a smiling catfish. Anyway this is probably the only place (definitely not that many around anyway) that you can see this fish so if you have that interest of seeing a legendary predator tropical fish, you have to make your way to Aquaria KLCC today! Once you stop gaping at the Tapah, you come to a small exhibit with some Archer Fish (also a local denizen in South-East Asia), you are greeted with a top view of surf-level fishes or fish close to beach side. It was amusing to watch feeding time, as they drop unfrozen Tubifex worms and small shrimp for the mullet (locally known as 'Belanak') and others, while suspending either Lettuce or cabbage for the Reef fish. Who would have known these guys would eat that!! This basically intros into the main spectacle of Aquaria KLCC which is their very well populated marine tank. Its full of local tropical marine fish including Sharks (Aquaria KLCC is currently running a 'Save our Fins' campaign to educated the public against eating Shark Fins) as well as Green Turtles. This marine aquarium setup is really a spectacle on many levels. 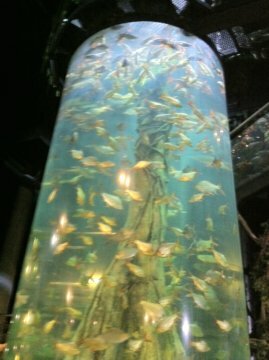 Firstly, they have a really slow walkalator that winds through the tank and you are able to see all the fish above you. This is something that many public aquariums have now, it lets you become 'part of' the marine aquarium, as you look above. Secondly, at feeding time, you are able to see the divers feeding the fish from a huge window on the side. The fish fed include sharks and rays. This is an awesome moment as you see hundreds (maybe even thousands because there are a lot of little fish too) of fish coming together and literally going nuts over the food. There are lots and lots of fish in this marine tank, there are Garoupas, Trevallys, Pomfrets, sharks, Rays, a whole Smorgasbord of Tropical Reef Fish and more. Right before the end, a couple of interesting seawater denizens too. 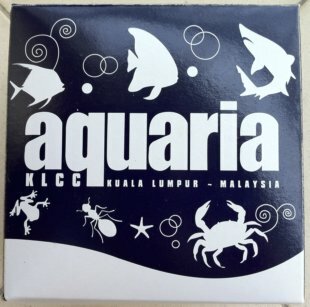 So how do I rate Aquaria KLCC? Well they cant beat Baltimore Aquarium of course (thats again my 'other town') but its done a really decent job of trying to show case the tropical fish around these parts. Definite must see for anyone in Kuala Lumpur and really for you Tropical Fish enthusiasts out there. If you have been meaning to go, well, go already. You wont be disappointed.